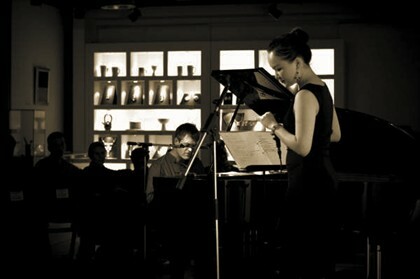 At Two Cities Gallery in Moganshan Lu, I stopped by to hear vocalist Jasmine Chen and my friend pianist Steve Sweeting on March 28. The Gallery was jammed, and I couldn’t even get close to the stage, but I did get a good idea of just what the performers were aiming for. It was Shanghai eclecticism at its best. It had a whiff of Barbara Cook with Wally Harper, the legendary duo of the 80’s and 90’s, with a relaxed, unhurried walk through thoughtful and unfamiliar repertoire. Well, unfamiliar because half of it was composed and written by the performers themselves, including Jasmine’s new lyric for the Paul Desmond classic, Take 5. Jasmine sings with a calm and pure understatement that allows the song to speak for itself. The audience loved this performance. There are a million food joints in Shanghai, so new discoveries are made every second. My latest favorite is a Sichuan restaurant near my hotel. The address is 1297 Kai Xuan Lu, at Anshu Lu. It is a typical rustic style Chinese restaurant, with big wooden tables and plenty of big red lanterns hanging from the ceiling. A big feature is the home brewed beer. Yes indeed, you may order black or white, and both are superb. Otherwise, we ordered some fine dumplings, a tasty frog dish with plenty of that Sichuan whallop, and a very flavorful chicken dish. Flavor. No shortage of it at this joint. I was the guest of Shen Hong, a Shanghai educator, who graciously and patiently listened to my outrageous ideas on secondary education (exam free, arts heavy, etc.) Jing provided the lively conversation. Yup, it was Jenny, Coco and the blogger for lunch in Xintiandi on March 28. Jenny is my Chinese teacher. She lives in Shanghai, I live in D.C. How do we do it? Chinesepod.com, of course! Jenny, truly one of the great slicers & dicers of language nuance, is my online Mandarin teacher. If you haven’t visited www.chinesepod.com, then you have not experienced modern education at its most sublime. I confess to spending at least 2 hrs per day, usually before 8 a.m., listening to Jenny & John go over the fine points of buying a battery or breaking off a relationship…in Mandarin, of course. See JQ’s notes on this event…Indeed a special evening when the stars agreed to indulge my whim and perform my own compositions, some of which required a vacuum cleaner to remove the dust from aging scores. Planets, Creation: A Jazz Suite, and the Jazz, etc collection were well represented. EJ Parker and Chris Trzcinski were in their usual razor sharp form, JQ Whitcomb did a beautiful Heaven and Alec Haavik carved up the Planets on tenor & soprano saxes. This was my first collaboration with Abraham Carmona, the startling Seville-born Flamenco artist, now performing around Asia. I have invited and he has accepted, so he will be visiting Washington, DC in the first week of August, including an appearance at Jazz on Jackson Place on Aug. 7. Coco performed his usual magic. This was a night to remember, and I am kicking myself daily for not recording the entire evening. left: Coco as whirling dervish. above: A.C. & JQ’s trumpet. EJ & Chris nailing it. The master classes (as they are called) at JZ School are always fun, especially when we get to the “after class coffee”. The second ACC was well attended at Cafe Bella by Yin Lei, Judy, Zhai Wen, Emily, and Ben Denton, but we missed Shinae! Yi, Shinae and Mei also attended the first class, and forgive me for not having everybody’s name. We covered the basics of the now legendary Cool Chord system. The Cool Chords enable anyone to sound like a genius in about 5 minutes, hence the name. I suggested to Ma Xiaohui that she meet Abraham Carmona, the Flamenco guitarist from Seville. Before I knew it, we were all onstage March 29 at the JZ Club in Shanghai with EJ & Chris. The first performance was a somewhat truncated Por Una Cabeza with AC singing and MX somewhat bewildered. On March 31, I insisted that we make a bigger production of the piece, and both artists had a chance to stretch on this tune. It was a bit of a struggle for MX to be onstage with a powerful performer like AC, but it all came together. MX also performed Ellington’s Sophisticated Lady with the Trio. 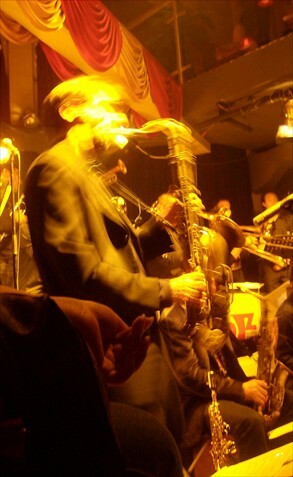 I give her credit for braving the jazz club…not exactly her milieu.